Hey everyone! 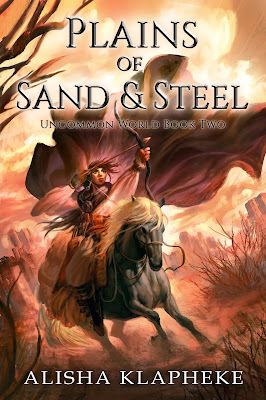 We are super excited to announce a tour we're hosting for PLAINS OF SAND AND STEEL by Alisha Klapheke which releases on June 16th! The tour will run for two weeks - from June 5th-9th & 12th-16th- will have two stops per day and will consist of a mix of reviews, interviews, excerpts, and guest posts. Review copies will be provided by the author via BookFunnel. We are totally stoked for the tour for PLAINS OF SAND AND STEEL this June! We can't wait for everyone to read it! This is the second book in a companion series (like C.J. Redwine's Ravenspire books) so you do not have to read book 1 to read this!